The project is sponsored by InPost, a postal service that allows you to send, receive and return goods using their nationwide automated parcel lockers. The lockers allow you to access your parcel at a time that suits you, even at 3am if you were so inclined! So no more waiting around for that courier or having to trek to your nearest parcel depot during rush hour. I am in team two and was second in the line to create my square. I managed to get a little head start on my project while I waited for the very talented Claire over at Maybush Studio to finish and send her stunning geometric patterned square via the postal service. I must admit I was having quite a panic about it all, I wasn’t sure how I was going to join the squares while keeping both the front and the reverse of the blanket neat without encroaching on Claire’s design. I wish I’d counted how many buttons I had attached, but alas, I forgot! 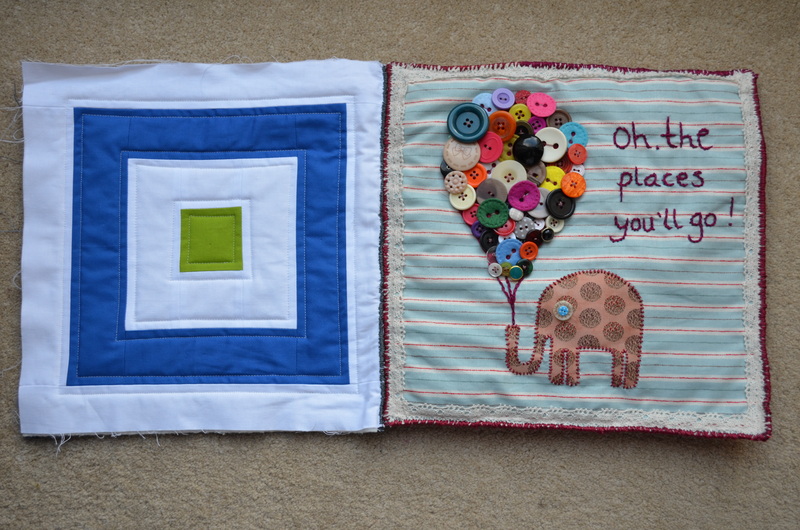 I ended up using an invisible thread to attach the two pieces which I then embroidered over the top with a maroon sort of colour to match my square and a blue to match Claire’s. I was working on it right up until the point that the courier collected it, I thought I might have to invite him in for a cup of tea so I could finish it! My fingers are still sore 24 hours later, but it was worth it. I’ve loved taking part in the project and I can’t wait to see the finished product. For now though, it’s over to Jen at Love Chic Living to create square number three.